Become a card-carrying, PADI-certified scuba diver by completing this PADI Open Water Diver course in Bali. Over the course of 3-days, you'll undertake 4 open water dives that will last about 45 minutes each and take you about 60 feet deep into the deep, blue Bali Sea. Before you take the plunge, a certified diving instructor will conduct extensive classroom sessions and swimming pool training with you. At the end of the course, you'll have explored vibrant corals of Bali and earned the certification of PADI Open Water Diver. Please note that divers are required to swim for about 600 feet and float in open water for 10 minutes, as part of the course. Due to high, underwater visibility of colourful fishes, the island of Bali ranks at the top of wish lists for most scuba divers. On this PADI Open Water Diver course in Bali, you'll travel to dive spots at Padang Bai and Tulamben. • Undertake 4 dives as deep as 60-feet for 45 minutes each. • Learn scuba diving in a small group with personalised attention. Divers are required to adhere to instructions of the dive instructor during the Open Water Diver Course in Bali. For cancellations made more than 7 days before departure of the Open Water Diver course in Bali: Full refund. For cancellations made 0-7 days before departure of the Open Water Diver course in Bali: No refund. Divers are required to have prior experience in swimming. As part of the dives, you will be expected to swim for about 600 feet and float in open water for 10 minutes. 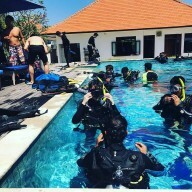 The tour operator reserves the right to change or cancel the itinerary of this Open Water Diver course in Bali due to bad weather conditions to ensure maximum safety of divers and staff. You'll be picked up from your hotel in Sanur by 07:00 hrs. At the dive centre, your training begins with classroom sessions where you'll be taught the theory of scuba diving. 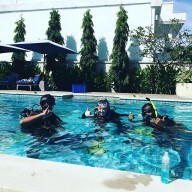 You'll spend the morning interacting with your diving instructor and learning safety procedures, hand signals and basic principles of scuba diving. After lunch at the dive centre, the course continues with a pool training session. You'll enter the swimming pool at the dive centre to test your skills and learn how to handle scuba equipment and navigate underwater. After a few confined water dives in the swimming pool, your training for the day will end. Spend the rest of the day at leisure. You'll be picked up from your hotel in Sanur once again and driven to the dive centre. Your diving instructor will do a quick briefing session at the dive centre, after which you'll proceed to the dive spot at Padang Bai. A short drive plus a boat ride later, you'll arrive at the dive spot. Under the supervision of your diving instructor, you'll dive as deep as 60 feet and undertake two open water dives that will last about 45 minutes each. 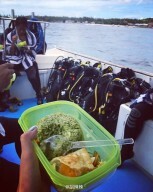 Between the two dives, you'll surface to have lunch and rest on the boat. But when you're underwater, you'll be working with your diving instructor as you practice skills leant the previous day and explore the underwater beauty of the Bali Sea. Return back to mainland after completing the two dives. You can spend the rest of the day at leisure. Dive into the deep, blue Bali Sea. Same as yesterday, your day begins as you travel to the dive centre and meet your diving instructor. Today, you'll travel to will travel to the dive spot at Tulamben to undertake two more open water dives. Explore the coral rocks on the Bali seafloor and spot colourful fishes swimming alongside you. Between the dives, you'll spend some time resting on the boat and preparing for the next dive. At the end of your dives, you'll return to the dive centre for a short examination and paperwork for your PADI certification. Your trip ends here. Swim alongside schools of fishes on the Bali seafloor. No accommodation is provided throughout the trip. Today's meal package includes lunch, snacks and water/soft drinks served at the dive centre between classroom sessions and pool training.